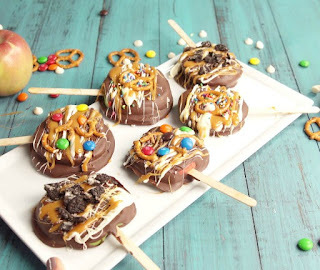 I have another delicious treat for you all, coming from delish.com! Set up a double boiler: Bring a saucepan of water to a simmer. Set a glass bowl over the saucepan (the bottom of the bowl should not touch the water), then add chocolate chips to bowl. Stir until melted, then stir in coconut oil. Place apples upright on a cutting board and cut into 1/2” to 3/4” slices. Using a paring knife, make a small cut onto the bottom of the apple slice. Insert popsicle stick. Line a large baking sheet with wax paper and grease with cooking spray. Dip apple slices into melted chocolate and place on the baking sheet. Refrigerate until chocolate sets, 5 to 10 minutes. Drizzle with caramel sauce and melted white chocolate and top as desired. Return to refrigerator until the white chocolate and caramel set, about 5 minutes. Serve immediately or store in refrigerator.